After recently reading an advertisement for a patch billed as an “authentic period reproduction” and soon thereafter seeing another ad for a “genuine collector copy” patch, I began wondering how many patch collectors who are relatively new to the hobby are confused by such descriptions. Even advanced collectors sometimes have to pause and ponder, for example, what the difference is between an error patch and a reject. In my opinion, the epitome of creative terminology appeared in a recent eBay auction that described an offered patch as “Semi-Original” because it was made by the same person who made the originals decades ago, using the same old sewing machine he used back then. Semi-Original? Really? There are a number of sources available that list and define terms, such as BEVo, bullion, doctored, gaggle, merrowed, etc., and thankfully there seems to be consensus on the descriptive terminology pertaining to construction (so I won’t repeat that here), but when it comes to tagging the patch, itself, there is too often disagreement about exactly how it should be categorized. I offer as an example the term “repro” that I know from experience is used by a number of collectors to disparagingly refer to virtually any patch considered undesirable. Spurred by these observations, I figured it’s time to attempt some sort of overall classification for military patches that both defines and standardizes classification terminology in order to guide the novice as well as remind the old-timer. I therefore offer what follows, below. For classification purposes, all patches are divided into two categories: Military, and Non-Military. Official – a patch of an organization’s officially approved emblem (i.e., the emblem has been submitted formally through channels to the headquarters or agency responsible for ensuring an emblem’s compliance with rules and regulations and then either approving or disapproving it). By the way, official emblems are protected by Federal law and their use is confined to the organizations for which they were approved. Approved patch – an unofficial patch that has been authorized by a competent authority (someone higher up in the chain of command). This authorization is sometimes published (contained in a regulation, instruction, or other printed reference), sometimes written (as in a letter or memo from a commander), and sometimes just verbal. Examples of these patches are so-called “wing king” and “pizza” gaggles displaying emblems, designations, and/or colors of lower-echelon components of an organization; patches of internal elements of an organization (e.g., staff, division, branch, etc. ); individual nametags displaying an organization emblem or a portion thereof, or organizational colors; and certain morale patches. Unapproved patch – any unofficial patch that has not been authorized by a competent authority. It should be noted that this does not mean unapproved patches are not allowed to be worn; most are. On those rare occasions when the wearing of a specific unofficial patch has been banned, it is usually because an individual in the chain of command has voiced displeasure with the design and made it clear, in so many words, its wear is not allowed. Achievement patch – indicates attainment of a specific goal or achievement, such as graduating from a course or program or winning an individual award (awards to groups are considered commemorative). Achievement patches differ from Qualification patches in that they do not pertain to a skill level or duty position. Class patch – produced by training classes (e.g., pilot, navigator, missile, space, weapons, etc. ), typically identified by a class number, which specifies the fiscal year and the sequential number of the class (e.g., 14-03 indicates the third class during FY 2014). Club patch – worn on civilian clothing (usually hats or jackets) by individuals, usually from multiple and diverse units, who have come together to pursue a common activity or perform a service that doesn’t necessarily relate directly to mission accomplishment. These include sports (Aero Clubs, Dive Clubs, Rod and Gun Clubs, Martial Arts, Running, etc. ), rank-specific organizations (Top Three Associations, Company Grade Officers Council, etc. ), and similar organizations. Sports clubs usually open membership to civilians who either work or live on base/post, so these patches are not worn by military exclusively and some collectors therefore do not consider them military patches. Note: Blazer patches worn by military employees of a service club may also be included in this category. Centurion patch- awarded to an individual upon completion of 100 carrier landings. Rarely seen is Double Centurion (for 200 carrier landings). Triples are rumored to exist. Death patch (a.k.a. Inactivation, Retirement) – commemorates the inactivation of a unit, decommissioning of a ship, or the retirement of a weapon system, or something related to it, often with the year(s) displayed. Deployment patch (a.k.a. Cruise or TDY patch) – produced to commemorate a short-term tour of duty at a specific location or in a general region. Distance patch (Miles or Kilometers) – earned by an individual upon reaching a designated milestone (e.g., 50 miles, 100 miles, 10,000 miles, etc.). These are usually running, flying, or “steaming” on a naval vessel. Duration patch (e.g., Alerts, Missions, Hours, Days, Months, Years) – earned by an individual after a specific number of completed alerts/missions or a specified period of time. Event patch (e.g., Competition, Exercise, Launch, Line-Crossing, Meet, Operation) – generally for a named event, sometimes with the year and perhaps a sequence number indicated, or the name of a trophy/award, and occasionally with “Winner” or “Participant” included in the design or on a separate rocker. Named combat operations and disaster relief or non-combatant evacuations are included in this category, as are less serious events such as patches for Shellbacks, Blue Noses, Mossbacks, and the like. Heritage patch – a patch ordered by a unit and worn by its members that features a historical design previously used by that unit. These are not considered reproductions in collecting circles, and usually bear some distinguishing feature(s) that make them identifiable as heritage patches (e.g., slightly different size, shape, color(s), wording, or if nothing else, the type of construction). Plankowner patch – Individuals assigned to a ship’s crew at the time of the vessel’s commissioning are called “plankowners” and patches for the ship, displaying this term, are often made for these individuals. END OF COMMEMORATIVES. Crew patch – specifies a particular group of military individuals in a tactical unit that, almost always, has been designated with a number and or letter. These are especially popular in the floating and flying communities and sometimes even contain individual names. Pencil Pocket patch – designed to be worn on the Velcro strip intended to secure the flap covering the writing instruments placed in the pockets on the upper sleeve of flight suits (but almost always removed by non-fliers, and sometimes even by fliers!). Qualification patch – specifies an individual’s skill level or specific position such as instructor, examiner, evaluator, team leader, crew chief, first sergeant, chief of the boat, plane captain, commander, etc. Team patch – worn by uniformed individuals, often from different units on an installation, who have banded together to pursue a common activity or perform a service that doesn’t necessarily relate directly to mission accomplishment. These are primarily Drill Teams and Honor Guards, although Bands that are not officially designated units also are in this category. Also, patches produced for wear by anyone/everyone on a particular installation to promote oneness (e.g., “Team Vandenberg”). Contractor (a.k.a., Factory or Manufacturer’s) patch: Made and distributed (usually free) by the maker of a weapons system, or sub-system, either to promote a company that is vying for a contract or to publicize a company’s involvement with a system in use. Strictly speaking, these are not military patches, although some have been adopted by military units and others are worn as morale patches—hence, they are often collected by military patch collectors. Fire Department: The fire departments on nearly all military installations are almost always civilian organizations administered by a civilian Fire Chief or Fire Marshal, often with civilians at lower echelons of command as well. Typically, the frontline firefighters are military, and even though they work at the Fire Department, they are assigned to a military organization and wear that organization’s patch on their uniform, not the Fire Department patch that is worn by the civilians (discussed in more detail under the topic of gray areas, below). Even though not military patches, they are collected by some military patch collectors. Fantasy (a.k.a., Hollywood, Movie, Theatrical) patch: Any patch (except the so-called Phantom patches from WWII) made for a fictitious military organization. Typically, these are either patches made for actors to wear on their uniforms to provide an air of authenticity and realism, or they are patches ordered by dealers for commercial purposes that are neither reproductions nor souvenirs. (Of note, leather patches have been made for movies depicting the officially approved emblem of real units—by RKO Studios, for example—but these are considered Reproductions.) Except for morale patches in the Novelty category, above, patches with bogus designations are not authentic military patches and therefore usually ignored by military patch collectors. Pool – Popular is the 1950s, 1960s, and 1970s, these were intended for wear on swimsuits, not uniforms, and although some military may have worn them, the majority ended up on the swimsuits of family members—usually children who frequented the base/post swimming pool during the summer months. The patches were purchased and functioned as a “season pass”; therefore, they always display a year, and if the pool was collocated with and administered by a specific club (e.g., the O’ Club), that sometimes appeared on the patch as well. (Patches without a year were worn by staff.) Although these are not actually military patches, they are sometimes collected by military patch collectors because of their close association with the military. Prototype (a.k.a. Proof, Sample): A single patch produced by a manufacturer for a military organization, and sent to that organization for inspection prior to producing the patch in quantity, that does not meet expectations and is changed in some way before being produced. Essentially, a prototype is a solitary Reject but it has its own classification category because a prototype is unique and therefore very tough to come by, and even though not an authentic military patch, some military patch collectors have them in their collection because of their rarity and for historical reference purposes. Reject: Patches that were ordered by an organization or individual and received, but were either refused and returned to the manufacturer or were kept but never issued/worn. Typically, patches are rejected because of a spelling error, incorrect size or color, or issues with quality. Errors may not be obvious or important to some buyers so manufacturers often dump returned patches onto the market to recoup some of their costs. It is important to note that not all rejected patches have errors, nor are all patches with errors rejected; therefore, patches with a misspelling, incorrect designation or ordinal, or some other problem are still authentic military patches if they were accepted and used by an organization. Patches that were rejected and kept (but not issued/worn) are often given away at air shows as souvenirs and/or mailed to collectors who write asking for a unit patch. Reunion: a patch ordered by, and intended for, former members of a military organization to commemorate a reunion of those members. Ideally, a true reunion patch should display the date, or at least the year, the reunion was held. It will sometimes also include the location and/or name of the veteran’s association that orchestrated the event. Some reunion patches omit these particulars, and when the patch is patterned after the official unit emblem, these then become very difficult to distinguish from heritage patches. As with heritage patches, reunion patches are not considered reproductions in collecting circles. Unfortunately, unscrupulous dealers are aware of this and some will therefore label reproductions as reunion patches to increase the odds of a sale. Souvenir: a patch, usually produced outside military channels, intended for sale during port visits, at air shows, museum gift shops, Army-Navy surplus stores, and other venues available to the general public, including online stores. Even some patches sold at military exchanges and clothing sales stores are in this category (e.g., “Retired” or “Veteran” with branch of service indicated). Although a unit’s booster club or similar fundraising organization may order patches displaying the unit’s official emblem, because these were made for the sole purpose of selling them at an air show, for example, rather than for wear on a uniform, these are souvenir patches, not authentic military patches (and the unit almost always ensures there is some notable difference between the souvenir patches and their official insignia). Some well-known examples that fit into the Souvenir category are the POW-MIA patch, most 9-11 patches, and the ubiquitous “Gone But Not Forgotten” patches. Another example is patches made specifically for collectors that are patterned after artwork for a proposed organizational emblem that was never approved (usually billed as “first design”). Bottom line: all these patches were made to make money, not to identify an active duty military member’s organization or increase morale. Veteran: Many organizations exist for retired military members and for those who served for a period of time but separated prior to eligibility for retirement. The criteria for membership vary depending on the nature of the organization. Although some of these associations are comprised exclusively of retired military who, although no longer on active duty, are still members of the military, their patches are not considered legitimate military patches. But because of their close association with the military, some military patch collectors collect them. There you have it. An important point that should be intuitive but warrants mention anyway is that not all patches worn by military on uniforms are military patches. For example, in the Air Force, on Fridays, personnel are usually allowed to wear any patch on their left sleeve. These are generically referred to as “Friday patches.” This is a wide-open category, and may include either official or unofficial patches (usually the latter, but some people like to display a patch from a unit they were previously assigned to), and even civilian patches (beer brands and sports teams seem to be especially popular). Although frequently worn, the civilian patches are usually not collected by military patch collectors. Guidelines for Friday patches stipulate they should be “in good taste” but evidence indicates that the guidelines are not always strictly adhered to. There are, of course, some gray areas so far as patch classification is concerned. Perhaps one of the best examples is patches for satellites and launch vehicles. It’s worth noting that some satellites are strictly military in nature (e.g., Defense Meteorological Satellite Program, Defense Support Program, etc.) but most are either NASA or commercial—and patches have been produced for almost every space system. Likewise, although in the past military boosters (retired ballistic missiles) were used to launch some satellites into orbit, the last of those was expended long ago and civilian rockets have been used ever since—and patches are also produced for nearly every launch. Again, these are civilian, not military, patches. Another gray area is patches of badges, such as official occupational—as opposed to organizational— insignia. Some examples are embroidered aviation wings, submariner “dolphins,” military police “shields,” and firefighter emblems. Looking just at this last category, and just for the USAF, all military personnel assigned to fire departments wear one of four versions of the FIRE PROTECTION USAF patch, depending on their position. Advanced degrees for other badges are often denoted by the addition of one or more stars, a wreath, or both. Navy ratings also are occupational rather than organizational emblems, but some military patch collectors will collect these as well as rates, rank chevrons, and anything else embroidered that’s attached to a uniform. Are these “military patches”? Answers will vary, depending on who you ask. Yes, a gray area for sure. Perhaps elaboration on some of the terms I used in the above descriptions is warranted. First, organization. Broadly speaking, organizations include not only echelons but also installations such as bases, stations, air fields, facilities, and the like. Also, the Navy considers ships to be units, so they are organizations as well. When discussing patches made during World War II for paper units that were never activated, I used the term Phantom rather than Ghost because today the term “ghost patches” is used to refer to those embroidered in only one color, layering the embroidery or using puff embroidery to make the design discernable. To avoid confusion, phantom and ghost should not be considered synonyms. As previously stated, a “period patch” is one that was made while the organization it came from was active. Although this means all patches from units currently active are, technically speaking, period patches, the term is reserved for patches from organizations that are no longer active. Patches from present-day units are generally referred to as “current issue” or “recent issue,” as applicable, or for active units that have been around for a long time, the decade when the patch was used is specified (e.g., “1980s era”). It’s important to remember that patches from organizations that have been around for a very long time may have come from numerous sources and/or with varying types of construction. For example, Strategic Air Command (SAC) existed from 1946 to 1992 and every legitimate SAC patch produced during those decades is a “period patch”—from early Schiffli loom products, to handmade pieces in the Far East, to the more recent multihead-stitched (computer made) patches. The point is that while “period” means “older” (relative to the present day), it doesn’t necessarily mean old. The term “vintage” is usually intended to convey that (although sometimes used as a synonym for “era”—as in “Cold War vintage”), but it is used so often by sellers attempting to enhance the appeal of an item that it has become almost meaningless—and readers will note I did not use the word in any of the above definitions. Another term frequently heard in collector circles that also isn’t mentioned above is “Eye Candy.” Although it’s usually intended as a degrading moniker for patches that are considered undesirable, the term is not contained in any dictionary and, if interpreted logically, can even have positive connotations—describing something that is pleasing to look at. Muddying the issue, a “Glossary of Air Force Patch Collecting Terms” on one popular Website has “Eye-Candy” patches in exactly the same category as Fakes and Fantasy patches, crossing the line into two completely different categories that are listed above (Reproduction and Hollywood, respectively). In fact, there are probably some collectors who consider all patches in the eleven listed categories of non-military patches to be eye candy! For classification purposes, I think it’s best to avoid subjective descriptions such as this, and stick to terms that are less likely to cause confusion. In summary, I am hopeful that the terms offered above, along with their corresponding meanings, will be accepted by collectors and used when conversing or corresponding with others so that any confusion or misunderstandings will be minimized or even completely eliminated. We communicate best when we all speak the same language! Admittedly, this effort is unlikely to deter unscrupulous sellers from using any term they think might work to seal a deal, but for those adhering to a higher standard (like, hopefully, all ASMIC members), it offers something that has been lacking for too long in the collecting community. Suggestions on ways it might be improved will certainly be welcomed. 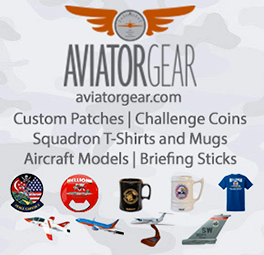 Flightlineinsignia.com is the largest, most comprehensive military patch site on the web. with new patches arriving weekly. ©2019 US Military Patches. All Rights Reserved.